035b – Excalibur | All Eighties Movies. All The Time! 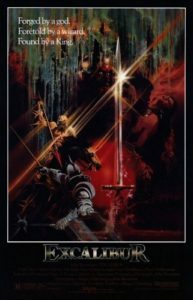 This week Gidgit Von LaRue and Angryman continue their look at the greatest cinematic treatment of the Arthurian legend – Excalibur. Plus, they do squeeze in a couple more references from the Monty Python version too! Our podcast buddies over at the Countdown Podcast can be found here! Great 2 part guys. I love this movie. MASSIVE Helen Mirren fan. You really paid tribute and I have not found many pod casts about this great and best version of this story re movie. I’ve commented before but will be listening for more. About to listen to Pet Sematary. I adore this movie. Thank you for respectful podcast. My late father was an extra in this movie. You both show such respect. I wish my father could hear your podcast. wow rossie, thank you so much for an amazing compliment! Our pleasure! never listened to a two part podcast and totally understand why you did this. great podcast and great movie. i listened to both parts on my flight. will check out more now.